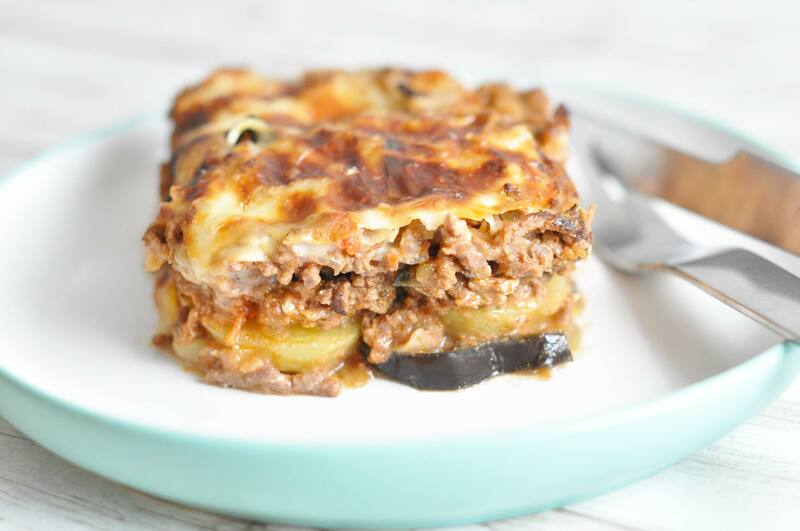 Moussaka is the Greek equivalent of the Italian lasagne, with the pasta sheets swapped out for aubergines. And in this version, spuds too. It tastes absolutely brilliant, and has become a new classic in many families - hopefully soon to be in yours too. This recipe is designed for two days. We're serving the leftovers with snack veggies on day two. Enjoy! 1. Preheat the oven to 225 degrees convection and boil the peeled potatoes in salted water. Blanch with cold water to cool them off. 2. Slice the washed aubergine to half a centimeters thickness. Pop them on a chopping board and sprinkle with sea salt. Leave them to sit for 20 minutes or so, then rinse off the salt and pat dry with kitchen roll or a clean dishtowel, and place them on a baking tray with baking parchment. Brush with olive oil and bake for about 10 minutes, or until golden. 3. Chop the onion and cook with a bit of olive oil in a deep pan or pot. Add the mince and let cook while stirring, until it's seared on all sides. Add cinnamon, chopped tomatoes, water and stock and let simmer for 10-15 minutes. Add salt and pepper to taste. Beat the egg with a fork in a cup and mix into the bolognese. 4. Slice the potatoes. Spread half of the baked aubergine slices across the bottom of a casserole tin. Spread a third of the bolognese on top. Now place the potato slices in an even layer, another layer of bolognese, the rest of the aubergines and a final layer of bolognese. Top with mornay sauce and grated cheese on top. 5. Bake the moussaka for about 20 minutes, or until the cheese is golden. Serve with warm bread. Enjoy! Aubergines vary in size, but it makes no difference if you use 100 grams more or less. If you have leftover mornay sauce, just pop it in a plastic container and chuck it in the freezer, then you have it for next time. And we recommend boiling some extra potatoes for packed lunches.